A wonderful relaxing holiday. Books, beaches, good food and plenty of R&R. Interesting projects coming my way. I’m so enjoying writing more and branching out offline too. Being part of a large blogging community. The #1000Speak for Compassion was such an uplifting experience. I now look forward to the buzz of the Blogging from A to Z Challenge. Gratitude as always for the support of my family and the absolute craziness of owning a boxer! I would like to share with you some ideas that have helped me with my gratitude practice. # 1 : Gratitude on rising. This is something I try to practise consciously. As soon as I awake I give thanks for the rest of the night before and for the day that is ahead. # 2 : Give thanks for shelter and a roof over your head. I always remember to be grateful for a home. When I’m leaving home for a long trip or when I leave a hotel room I thank the room for providing me with shelter, security and comfort. 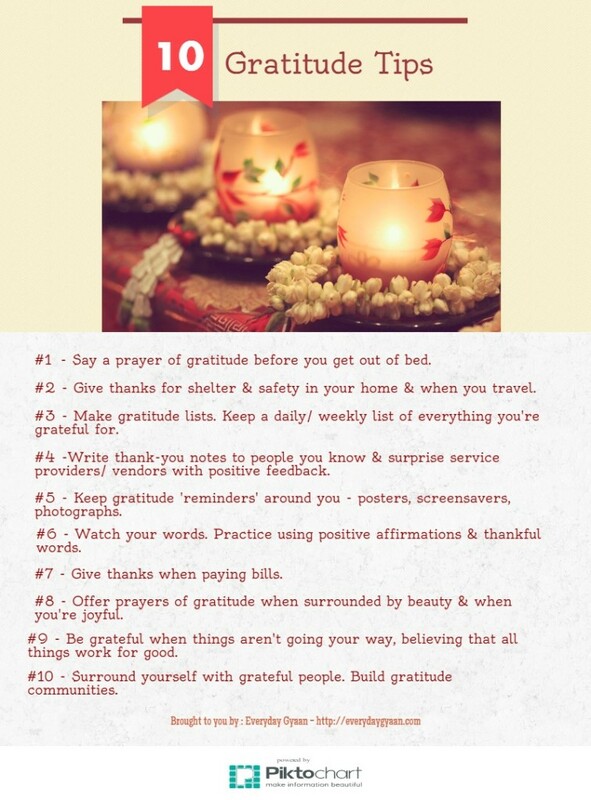 # 3 : Make gratitude lists – write daily, weekly or monthly list. Keep a gratitude journal. Jot down things you are grateful for. Our monthly gratitude circle is a way for you to share your gratitude lists. # 4 : Surprise family, friends, service providers with notes expressing gratitude for what they do for you. # 5 : Collect and display ‘reminders’ of gratitude – posters, pictures, screensavers that remind you to be grateful. # 6 : Mind your language. Don’t whine and curse. Give thanks. Use grateful words and repeat positive affirmations. # 7 : Give thanks when paying bills. I loved this post and have decided to adopt this into my life too. Gratitude is an affirmation of abundance! # 8 : Remember to give thanks in times of happiness and joy and when you’re enjoying Nature, art, a book, a cup of coffee, even. #9 : Give thanks when things are tough and are not going your way. This is a tough one, but it is a true test of whether you’ve adopted a gratitude attitude. # 10 : Surround yourself with grateful people. Build gratitude communities. Be a part of our Gratitude Circle today! Would you like to add any more tips to the ones I’ve shared? Please do so in the comments below. Today I’m joining with Vidya Sury for our monthly Gratitude Circle post. Write a gratitude post on your blog and link it here. Love this!!! Thanks for including us in this post! Thanks! I thought it was a great idea! Thanks Corinne. My tip is – to maintain perspective, especially when things don’t appear to be going well. Meaning stand back from things and try and look at them from a distance so that you can see the bigger context of your life. Oh yes, isn’t it amazing how it all fits in when you look at things from that perspective? Thanks, Judy! Loved your post. It all boils down to living in the moment and being grateful for the little things, no? Love the piktochart. 😀 Cool idea! Always the little things, Vidya! Thanks!